In choosing a religious studies minor you will investigate the role religion plays in shaping contemporary societies across the globe, how religion has been used for oppressive and liberatory purposes, and religious perspectives on the meaning and significance of human existence. You will study religious beliefs, practices and scriptures to gain a deeper understanding of the world’s various religious traditions, their place in today’s diverse and globalized world and a greater critical self-awareness. Through coursework aimed at engaging multiple perspectives, you'll explore religion through history, literature, music, sociology and philosophy. Interdisciplinary coursework focuses on building appreciation for human cultures and understanding humans' place in the cosmos. Campus encourages and supports a multitude of viewpoints and a global perspective through courses, community service opportunities and campus activities. Religious Studies and Jewish Studies provide several courses that fulfill requirements in the Liberal Education Program. 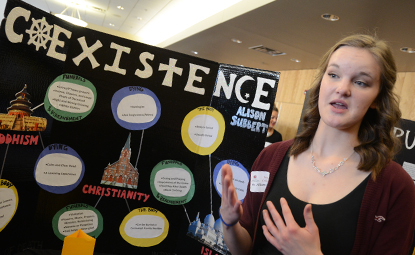 Students who earn a minor in religious studies may pursue careers in social service, journalism, international business, law,primary and secondary education, health care and various religious professions. A diverse group of more than 200 students, most based at St. Cloud State, performed "To Be Certain of the Dawn," a healing oratorio in commemoration of Holocaust victims in Natzweiler-Struthof, a former Nazi concentration camp in France.